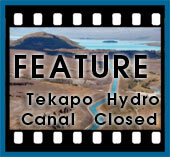 Photo gallery - Images from the Lake Tekapo area. This advanced photo gallery responds to mouse activity. Place your mouse against the right hand side of the window below to view all the images as thumbnails. Run the mouse over the image for more information about it. All images are available to view as a slideshow. Select "play slideshow"at the bottom of the image window.